Update September 25th 2011: Music Making For People With Disabilities is now a category in my Blog. I have a disability, and for many years, I had allowed it to stop me from performing. This changed when I saw the documentary Touch The Sound about Evelyn Glennie. She is the World’s first full time Solo Percussionist, and she has been profoundly deaf since her teens. “Profoundly deaf” means she lost 90 percent or more of her hearing. Watching the movie was an outright epiphany. I have made it a major concern of mine to encourage and promote music making for people with disabilities. I expect to see Evelyn Glennie playing at the National Concert Hall on December 9th with the RTE National Symphony Orchestra. I booked early and grabbed the best seat in the house (also the most expensive one, ah, well…): balcony, front row, centre. She’ll be performing Der gerettete Alberich, a percussion concerto by the American composer Christopher Rouse. Update: I met with Dame Evelyn after her performance – and I wrote a lengthy post about the trip to Dublin and my nervous anticipation, including a little review of the concert. In this picture (image credit: Jim Callaghan Studio) she is playing a Waterphone. The Waterphone is a piece of Sculpture made of bronze and stainless steel, designed by the American painter and metal/bamboo sculptor Richard Waters… and it makes beautiful atonal music when you bow or tap it. He actually patented it as a musical instrument, and it is used quite a lot in movie sound tracks. Some symphony orchestras own one or two of them, too. Apparently, he made about 1000 of them during the last 40 years, each of them unique in a way – but there are probably thousands of imitations around. I’ve also occasionally spotted the characteristic design being adapted (stolen?) for sports trophies. Update: I own one since yesterday (July 29th, 2011)!!! With my name engraved on it – thank you, Richard. 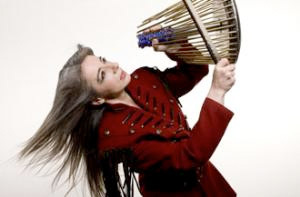 Evelyn, now Dame Evelyn Glennie is a very special musician. When she performs she plays barefooted so she can feel the vibrations coming through the floor and she positions herself so she can see both the audience and the orchestra.